THE X-ROOT IS DEVELOPING THE NEXT #1 APP, THIS TIME IN THE SPORTS SEGMENT! 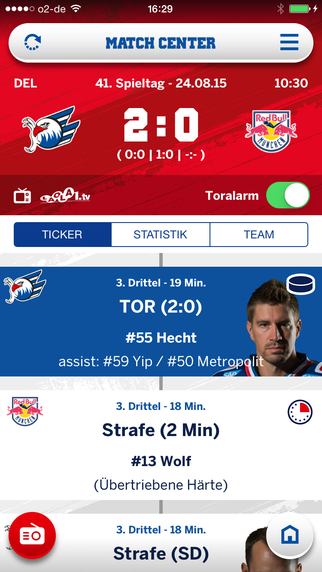 In close collaboration with the Munich-based agency Spleen and SAP, we are developing an App (native iOS and Android) for the seven-times German Ice Hockey Champions, Adler Mannheim. The App rewards fans for their loyalty and permits the Club to personalize its offers for its fans. In addition, fans are able to access team information, statistics, a live ticker and current articles from social media in order to get even closer to “their” team. Fans can profit from exclusive premiums via the integrated Coupon Center! We have developed a Watch-app! 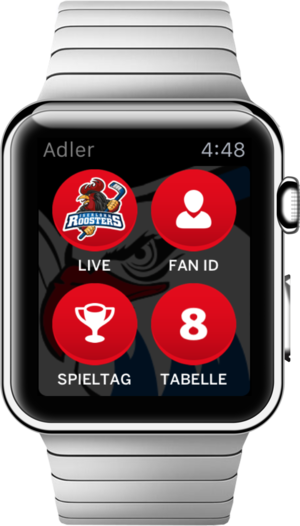 The Adler Mannheim (Mannheim Eagles) are not just at the top of their league on the ice, but also, thanks to x-root, concerning the provision of their loyal fan community with club information. 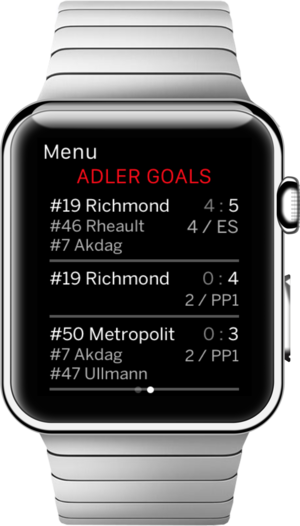 Ice hockey lovers are now offered, in addition to the Adler Smartphone-App, a Watch-App by x-root, which brings them even closer to their favorite club. No time to cheer on at a game? No problem! A brief check of your wrist revels the current progress of the game, all highlights and statistics on current matches. Another successful project in close collaboration with the Munich-based agency Spleen Advertising! In addition, the game results of the day are visualized and insights into the ranking are offered. Registered users always have their Fan ID to hand and can profit from coupons and obtain premiums for every transaction. THE OFFICIAL APP FOR DUNKIN’ DONUTS Germany! The Dunkin‘ Finder indicates the nearest DD Store, including address, opening hours and free Wi-Fi availability. Using mobile coupons, you can save a lot of money on your next DD visit. It is really easy to redeem the changing coupons: simply show them on your display when ordering. That’s it! The App includes many additional functions, such as current promotion news or comprehensive information on DD products. With this project, we developed two native apps with outstanding haptics, without any bucking or jerking, and, of course, full offline capability. Dunkin‘ Donuts is in a position to manage all app data, current offers, news and coupons in real time centrally and to distribute them onto the apps. Individual push messages directly onto the device reduce the distance to the customer. Together with our partner, weblizards, we provide the country- and multitenant-capable backend and also the associated infrastructure for the entire system chain, including all-round care-free support. In close collaboration with the Munich-based agency setup, which supports BURGER KING, we have developed an App that is serving several countries from one source through a connected CMS (Pimcore). The CMS was provided by our partner weblizards, who specialize in Pimcore. The new BURGER KING App is just to your taste. Wherever you are, the integrated KING FINDER gives you the shortest route to the next BURGER KING restaurant. And using the Mobile Coupons, you can save a lot of cash. Simply select Mobile Coupons, show them at the cash desk in the restaurant – and enjoy. Over 1 million users are already delighted. In close collaboration with the Hamburg Agency Peter-Schmidt-Group – who are responsible for the visual representation of the gases – we created an APP which allows users to experience the project “Fascinating Gases” and the process of air separation in particular on their tablet. The App invites the user on an interactive journey of discovery. 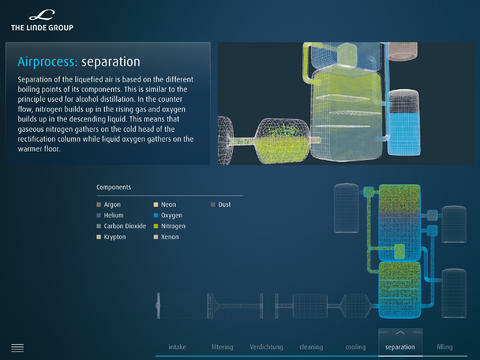 In addition to the visualization of the different gases, the air separation process patented by Linde which is explained through animations, texts and sounds, is a central element of the App. Our partner amp GmbH provided the excellent sound. This innovative project was a particularly interesting challenge for us, which initially raised the question of how we should visualize products and processes optimally on a tablet device under iOS and Android – the answer: Here we were able to incorporate our entire know-how and to develop a completely new operating concept – all visual components have been developed from scratch at x-root. mesh is a location-related social network. In addition to the native Apps in iOS and Android, x-root also developed the entire backend. x-root IT systems designed an architecture for the highly available and extremely scaleable system landscape, set up the systems in European computer centers and now operates this service including monitoring and performance measurements. Everything from a single source and in close collaboration without friction losses! The app layout and the mesh brand were designed by SPARKS STUDIO in London.